Focus Magic's hidden strength is its ability to sharpen images that are already in focus. If your digital photos are fuzzy or out of focus, don't give up. Use a little magic. That's what I've been doing over the last few weeks. I've been trying out two magical image-enhancers. I'll tell you about them this week and next. The first and most exciting is the latest version of one of my favorite programs, Focus Magic, from www.focusmagic.com. It miraculously turns those goofy out-of-focus pictures you took at the family reunion into images you could hang at the Louvre. The latest version of Focus Magic is vastly improved over the older one -- it's easier to use and figures the proper settings out for you, so all you have to do is click once to rescue your masterpiece. Focus Magic runs only under Windows. There is no Mac version yet. I've been running the beta version of Focus Magic. I've used the previous program, version 1.23, for many months with great satisfaction, but I wasn't prepared for the dramatic improvement in the current version. It does everything for you except make you a cup of coffee. 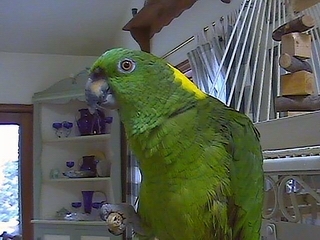 Photo of Joe, the author's Yellow-Naped Amazon parrot, shown before (left) and after (right) treatment by Focus Magic. Notice how everything in the image seems sharper. There's no work at all when you fix your blurry images. Focus Magic spends a few seconds examining the image, then tells you how much blur correction it thinks the image needs. It even changes its settings to match the blur factor. All you do is click on a "green light" in the toolbar. Focus Magic's hidden strength is its ability to sharpen images that are already in focus. In my example photo here, I've used Focus Magic to sharpen a picture I took of our parrot, Joe. You can see the amazing improvement in clarity by looking at his eye. The standard method of sharpening, called unsharp mask, cannot make such an improvement. I'm an unqualified fan of Focus Magic. In addition to the now-you-see-it, now-you-don't way it gets rid of blur, Focus Magic also has a separate function that enlarges images without making them blocky and ugly. If you do a lot of resizing -- especially if you have to enlarge some of your photos to get them to print better -- you need Focus Magic more than you might realize. The method Focus Magic uses to resize images without telltale jaggies makes other methods, such as the built-in image resizing in both Photoshop and Photoshop Elements, look like amateur night at the programming office. But you need to know that Focus Magic is very, very slow. If you work on truly large images the way I do -- mine tend to be 2,000 to 4,000 pixels wide -- you'll find Focus Magic is an ideal excuse to make a sandwich, drive to Topeka or take a nap. Processing a single large photo can take a few hours unless you have a fast computer. You can always do other tasks while it's working, of course, but you won't be able to use Focus Magic to fix up a panorama three minutes before that important meeting. Another problem: The standalone version of Focus Magic is brain-dead when dealing with non-JPEG images. It can't load or save any other kind of image. But the plug-in automatically installed with Focus Magic does not have that JPEG limitation. Here's a tip: Buy version 1.23 and install it, then download the much improved beta version and install that. Your registration will work with the beta version also. Next: Resize Magic's special touch.